A man whose wife disappeared two decades ago died knowing that her body had finally been found, an inquest has heard. Joe Finlay had waited 24 years for answers after wife Pauline vanished in County Wexford, Ireland, in 1994. Her remains washed up on a north Wales beach months later. Dublin Coroner's Court heard she was not identified until her body was exhumed in December 2017, shortly before Mr Finlay died. During an inquest on Monday, coroner Dr Myra Cullinane heard that Mrs Finlay's final resting place was revealed when detectives tested DNA from the remains found at Cable Bay near Holyhead with a sample from Mrs Finlay's brother, Joseph Hanlon. The coroner asked Mr Hanlon whether the identification had been confirmed before his brother-in-law died. "It was, yes," he replied. 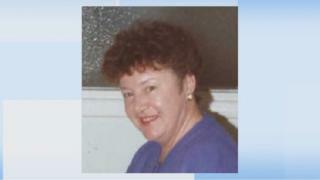 Mrs Finlay, 49, disappeared in County Wexford while out walking her dogs in 1994. Leg and hip remains were found at Cable Bay, Holyhead, seven months later, but police failed to identify them and they were buried without identification. The unmarked grave was exhumed as part of a cold case review by North Wales Police. After the DNA match was confirmed, her body was returned to Ireland earlier this year. Dr Cullinane said it was likely Mrs Finlay had slipped and drowned but, as there were no witnesses to the incident, she could not specify the cause of death. However, she hoped the identification of Mrs Finlay's body had brought a measure of finality to the family's many years of "unanswered questions".